These three discs come from a series with the rubric "Musik… Sprach der Welt" or "Music… the world's language." They are calculated to appeal to collectors of a certain age, or at least to those who appreciate recordings that have been burnished by the patina of time. All the material dates from the 1950s, with the exception of Beethoven's Piano Concerto #3, which was recorded in 1962 and is in stereo, unlike everything else reviewed here. DG has housed the discs in neat digipaks, and the covers are reproductions of the covers the label used at the start of the LP era: a plain beige background with a wide lemon-yellow stripe running down the middle. Who needs cover art? Perhaps because this is a lower-priced reissue series, booklet notes have been almost completely dispensed with. Instead, we are given a paragraph about the featured conductor in English, German, and French. 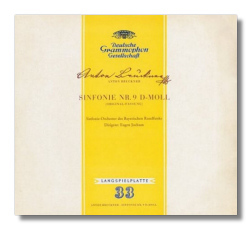 Jochum's recordings of Mozart's Symphony #33 and the "Linz" Symphony have not been released internationally until now. They, and Jochum's Symphony #39, were recorded in 1954 and 1955 in the Herkulessaal in Munich's Residenz. Jochum was a masterful conductor in this repertoire, and he will please anyone who wants virile yet not unstylish readings of these symphonies as played by a modern orchestra with more or less the full complement of instruments. At his best, Jochum defies gravity, like a tightrope walker – try the Menuetto from the "Linz" Symphony, which is as light as a Viennese pastry, but nevertheless no less mysteriously filling! Everything is natural, unforced, serene, and human – Mozart as a loveable genius, and not as a cold and marble Olympian. Apart from the fact that the recording is monaural, with a small amount of hiss (noticeable only during musical silences), the sound is so good that it could be mistaken for a modern production. Jochum recorded Bruckner's Ninth Symphony at least three times in the studio – twice for Deutsche Grammophon (the second time in stereo) and finally for EMI. No doubt the second DG version was made primarily because the label wanted a stereo version in its catalog. There are no flies on this earlier version, however, which was recorded at the end of November 1954. In fact, this is one of the most impressive Bruckner Ninths I've heard in a long time. In the outer movements, it is visionary, with a faraway look in its eyes. The first movement is heroic but not vainglorious, and Jochum organizes the movement perfectly. The Scherzo is conducted with a gracefully Mephistophelean menace, and here, the members of the Bavarian Radio Symphony show off their agility and precision. In the Finale – to my mind, the most miraculous symphonic movement ever written – Jochum and his Bavarians are supremely moving. A touch of stoicism appropriately keeps the movement from falling over the edge into self-pity. The very end of the symphony is like a radiant summer sky at sunset. As with the Mozart CD, the sound is, for all intents and purposes, modern, even though it is monaural. 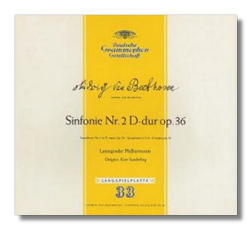 It seems that Richter's Beethoven Piano Concerto #3 would have been a prime candidate for reissue in DG's "Originals" series, but here it is on a CD where the focus is the conductor. Kurt Sanderling came to the Soviet Union from Germany in 1936, having been labeled a "non-Aryan" by the Nazi regime. In Leningrad, and later in East Germany (having returned there in 1960), he made many excellent recordings. Few of them are known in English-speaking countries, however, so this reissue is to be welcomed. As pigeon-holers, we tend to look to Soviet artists for Russian repertoire, not realizing that these musicians had as much to say about Bach, Beethoven, and Brahms as anyone else. 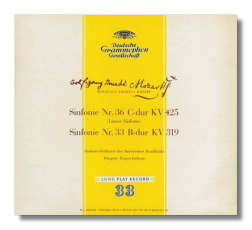 Sanderling's Beethoven Second, recorded in 1956, is more interesting than the one he recorded early in the digital era. (If I remember correctly, that Beethoven cycle was sponsored by a brand of cigarettes!) It was recorded in Vienna, while the Leningrad Philharmonic was on tour. The orchestra plays with character, and Beethoven's orchestration is brought out with sharp definition. Sanderling's interpretation is traditional, with plenty of masculine muscle, but also with sensitivity to the work's roots – Haydn's late symphonies, for example. The Third Piano Concerto has many of the same qualities, and Richter, as expected, plays it with authoritative grandeur. He is insistent, even forceful, but never hurried. Richter could be more exciting than this live, but he also could be cavalier, and this is one of those studio recordings that stands up to live recordings that have been circulating for decades. Again, the sound here is superb, and no one should be disappointed on that account.